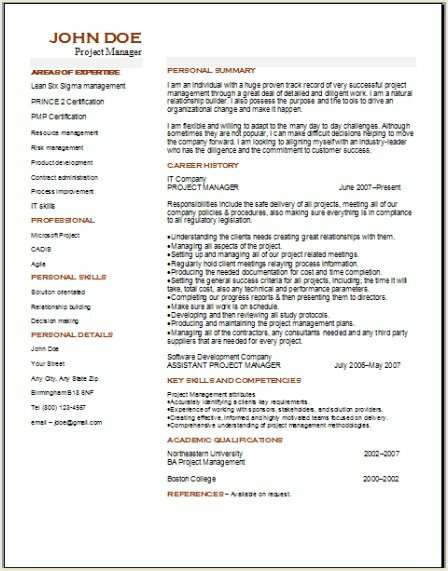 Above you have a couple different choices, of a very professional looking project management resume. Today quite a few companies are using more project managers, helping them to better implement new strategies, or to evaluate their existing processes and also to help with improvements in their company. This is now leading to an overall increase of well qualified, project managers who have years of experience to take charge of these difficult projects and to help ensure they are successful. A good project manager has the ability to focus in on details, letting them get a view of the bigger picture of things, which will enable them to lead their own team to complete the project effectively and efficiently. 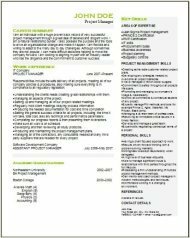 So let’s have a look now at a basic project manager’s resume so we can determine what type of qualifications that you will need to help you secure the position of a project manager. Starting with the overview section. This will be the section where adding your details dealing with goals and objectives that you have obtained as a project manager. This is were you should highlight all your skills relevant to the position you are applying for, and your specific capabilities as a project manager. After you complete this section, you want it to reflect the best skills and abilities that you possess. 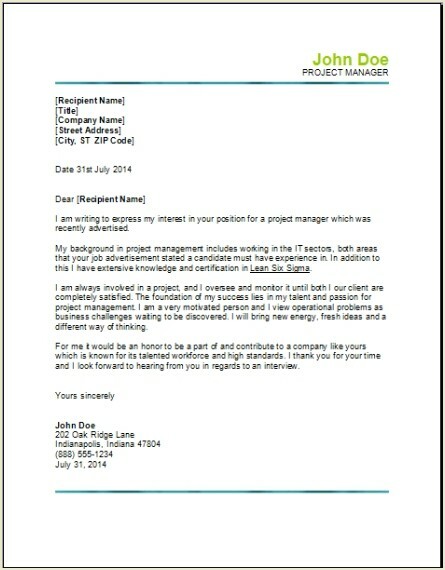 The objective here is to show you are their prime candidate for the project management position. This certification section is where you want to list all your courses, your certifications and also your qualifications that will show your prospective employer you have extensive training, and their project will be handled professionally. List all courses and all qualifications that are relevant to the position you are wanting to apply for and pay special attention to the project management industry in general. Prince2 Certification was originally designed by the British government for their own use on projects. The Prince2 certification has now developed and become known as a top notch certification for all project managers that are working not only in the European Region, but throughout the world. One source of many to look into would be APMG International. They are accredited professionals who offer the certification along with many other fine project management certification. The Prince2 is like a 7-7-7 approach. They consist of 7 processes, along with 7 principles, also 7 themes. The abbreviation stands for Project Management Professional certification. This is recognized not only throughout all of North America but also in the rest of the world. PMP is the top project management type certification that is available today. The Project Management Institute offers this certification, and this particular approach has five phases of project management. Together these create an efficient and effective project management program to follow that is very successful. The is a fairly new certification that is put together with the principles of putting together the LEAN management program with the Six Sigma program for waste reduction and also management. These types of certifications are then offered in many different levels that are called belts, you could say that they resemble the karate self defense belt system. The belts of Lean Six Sigma are very similar to that of Karate, they are the white belt, the yellow belt, the green belt, the black belt and also the master level. Now let"s get back to the resume and remember an important factor. Creating your own resume to show employers the value you can bring to their organization will make the difference. You need to really make sure that your information highlights all of your skills and abilities pertaining to the job at hand that you are trying to win. No information should be omitted if it pertains to the exact project involved in the job description.